I had the pleasure of interviewing Lindsay Nuon. Lindsay began her formal career in Technology in the US military 15 years ago and has since worked in the US Intelligence Community with government agencies including NCIS, the FBI, and HHS; Fortune 500 companies and one of the hottest Cybersecurity start­ups in the industry topping best lists from Dark Reading to WSJ. 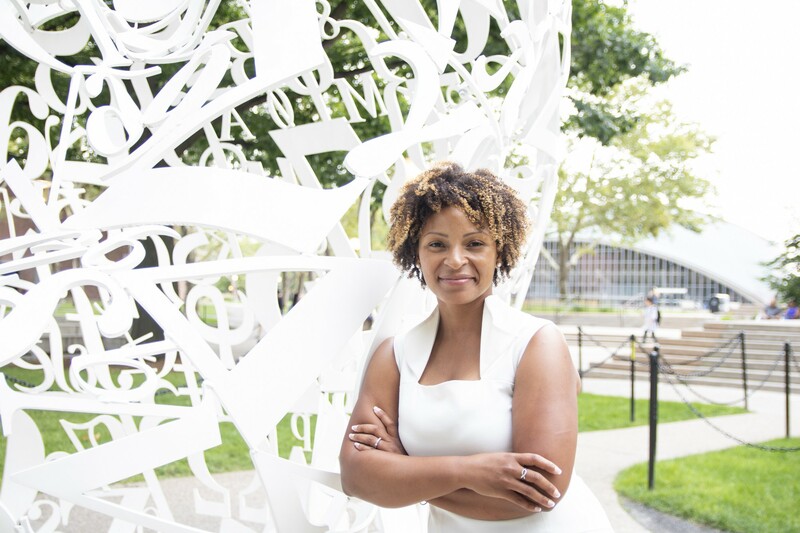 She is currently the Founder and CEO of the global nonprofit, Women of Color in Blockchain, ISACA Blockchain Subject Matter Expert, and advisor and mentor to many. The pleasure is mine. Thank you for allowing me to share my story. Cybersecurity is a family business. I was fortunate enough to have a father who modeled excellence in the industry and an entrepreneurial spirit; he was a representative of what a professional career in tech would be like. That, coupled with a mother who reminded me constantly that there was nothing I couldn’t achieve, was pivotal. Their contributions planted and nurtured seeds success early in my life, but I believe the single most important component to those seeds growing into what they have is my commitment to service. That is the lesson I hope others learn from my story; I believe Ghandi put it best “The best way to find yourself, is to lose yourself in the service of others”. Sure! I founded WCB, a global nonprofit focused on uniting and empowering WOC in the Blockchain ecosystem shortly after attending Consensus this year and noticing that something was amiss, even though we existed, WOC were largely omitted from the narrative. 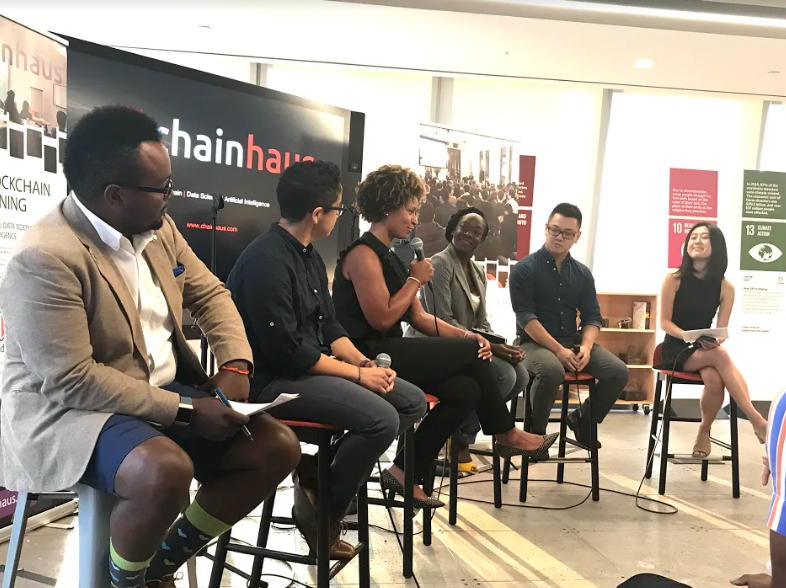 Building this organization has been as enlightening as it has been rewarding because it’s given me the opportunity to learn about so many amazing projects lead by Women of Color and to partner with other organizations who have exhibited a true commitment to Diversity and Inclusion, like The Blockchain Institute, ConsenSys, and BitMari. WCB is leading the charge on research efforts to ensure a more equitable evolution of the Blockchain industry as a whole, partnering with blockchain projects and training and education providers to extend invaluable opportunities to our members, and so many more exciting efforts to come. University of New Hampshire Law will be offering the first-ever Blockchain & Crypto Certificate Program early in 2019 and I’ll be teaching courses on Blockchain, Data Security & Privacy and Inclusion & Social Impact. I’ll also be working with some amazing security professionals and ISACA to launch a blockchain audit program. I’m the Chairwoman of the Board for G | Code House, which is a modern day effort that pays homage to White Rose Mission founded in 1897 by connecting young women of color to aﬀordable co-living space, technology instruction that will include, but not be limited to blockchain technology, industry placements, and post-secondary education. And my company EmpirEqual — where we are creating a solution that couples my experience in the technology sector with my passion for Diversity, Inclusion, and Equitability and an absolutely amazing team. I’ll be able to share more about what we’ve been up to there very soon. My wife. She is my backbone. Without her unyielding support, willingness to sacrifice, and belief in me I wouldn’t be able to give any of this my best. Even though the specific stories are too intimate to recount, they aren’t unique. Everyone their own unique version of a time when the their spouse was the hero or heroine of an extraordinarily tough period, when the dinner got cold, or a special day came and went while you were at work. The nascence and the palpable energy that we experience as a result; the people so inspired by the possibility that this tech brings they rise to solve some of society’s most difficult challenges, and the timing — there is an undeniable convergence of a global outcry for a deeper level of consciousness and equity than preceding versions of the web were created with and the technological means to actually achieve that. My hope as that with the motivation, means, and sagacity we will create a better more unified world. My worries can be broken down into three categories people, process, and technology: pluralistic ignorance and polarization, an erosion of accountability in new governance models, and last but most concerning are the security and sustainability issues that are being ignored for the sake of innovation. Web 1.0 and 2.0 have yielded inumerable issues; with data privacy, an increase of the digital divide, technology outpacing policy — my chief concern is that we fail to head the lessons that history has taught us. My investment in others has increased commensurate to the growth of my platform. There isn’t really one situation that stands out more than any other, because every opportunity that I’ve seized to pay it forward has paid dividends. Well, before I get to your question I can’t help but address that statement. It’s reminiscent of the ‘pipeline problem’ excuse that fuels unproductive rhetoric. It gives us permission to accept the status quo and remain hyper focused on the hardest area of this multifaceted challenge to address. In the past 20 years, the share of underrepresented minority women earning Science and Engineering degrees more than doubled at the master’s and doctoral degree levels. More under represented minorities are pursuing degrees than ever before, and ironically more women than men earn college degrees, even as the number of women studying computer science is falling. So while there aren’t nearly as many POC in tech as there should be, there are plenty qualified POC in tech and tech adjacent fields hiding in plain sight. To other women and men of color, I’d say the three most important qualities you’ll need to thrive are resilience, a sponsor, and a commitment to lifelong learning. Intentionality, reform at systemic level, and the willingness to abandon the things that haven’t worked. Instead of top down initiatives we should be moving toward a new model that I’ve developed called Distributed D&I, instead of disingenuous hiring and recruiting efforts we demonstrate our organizations commitment to inclusion by showing the representation that we’ve achieved in the technical and leadership ranks, partnering with non-ivy institutions to source and develop talent — simply put actions speak louder than words. Show POC they will be welcomed and empowered in this industry instead of just talking about it. “To those whom much is given, much is expected”, it’s a verse that my great grandmother recited to me from the time I was a little girl. I had it committed to memory even before I could even read because it was reinforced in the way she lived her life. I had the opportunity to experience it firsthand, and as the saying goes, there is no better teacher than experience. My fervent plea is for everyone to join me and others around the world who are working diligently on these issues, to wage war against workplace inequality. While I understand how disheartening the headlines and statistics can be, I truly believe that with a bias toward action, we can restore safety, dignity, opportunity, and equality to the workplace. And because all movements have a hashtag these days ours would be #TIDES, Tactical Inclusion, Diversity, and Equity Strategy — use it to show others what you are doing to make a change, use it to call for collective action, see it and be reminded that there are others who are with you in this fight.